Get ready to fight the war anew! The Rackham scifi tabletop miniatures game AT-43 was originally going to use the Dust licence, and be an ‘alternative WWII plus scifi and supernatural’ game based on that world created by Italian illustrator Paolo Parente. But instead AT-43 became far-future sci-fi (though still with a recognisable WWII feel) and eventually died out along with Rackham, and Parente and his collaborators continued with their own miniatures game, which became Dust Tactics and is now published by Fantasy Flight Games. And to go full circle, there’s also now a set of tabletop rules using Dust miniatures: Dust Warfare. Dust Tactics is a boardgame/miniatures game hybrid. At first I thought this was a disadvantage, but after playing the game I can see that despite the simple rules, there’s a lot of flexibility and possibilities for this game, and it successfully manages to be ‘cinematic’ in feel despite the simplicity. So how does it work? The key to the game is the simplicity. Games are played on terrain squares (or a paper mat in the revised edition), each of which is divided into nine squares. Instead of using a tape measure to measure the moves of each miniature, you simply put the five man squad or robot tank in a square. Line of sight is then measured between central dots in the square, with some easy rules for soft and hard cover. When you shoot or engage in close combat, you refer to each unit’s card, which not only has a nice big picture of the relevant miniature(s), but a few lines detailing the weapons it uses, their range, how many dice they roll and how much damage they do per hit. Dice marked with hit symbols on two faces do the rest. If it’s so simple, why is it so good? That’s the magic of gaming. It takes just a few minutes to explain the rules, and after a round or two you begin to realise the game has a lot more to it than is immediately apparent. One of these surprising realisations is that the square movement grid, coupled with the differing abilities and specialisations of the units, gives the game an almost chess-like feel. Far from charging into conflict right away, you begin to identify which of your units and which of your opponent’s were the long range specialists, which were especially effective at close combat, and how to avoid, or move quickly to engage, the appropriate units. During each of your unit activations you get two actions: you can move and shoot, or shoot and move, or move twice, or shoot twice (actually shoot once and get a re-roll on misses). Some units are a bit faster than the others, and some can jump obstacles, so movement isn’t at all predictable, and good use of cover (you get two ammo crates for soft cover and two tank traps for hard cover) makes a big difference to your long-term survival. Combat is quite deadly, so one mistake can spell disaster. However with a healthy dollop of luck, anything can happen and the outcome was always in doubt. But beyond all that, the game has that special something that gets you laughing, cheering and most importantly, imagining the scene. On the table, a few plastic models move about on cardboard tiles, but it’s easy to imagine the real scene—as the Allied robot tank rumbled forward and let fly with a stream of napalm over the Germans, the German tank grabbed it with its claw, ripping its turret off while the squads let fly with laser rifles around their feet—and to me, that’s the hallmark of a great game that you are going to come back to again and again. I call it the ‘cinematic value’ of a game, and it’s there when the rules recede into the background and you feel like a movie is playing out on the table before you. In the core game, there’s a series of scenarios that link together into a mini-campaign. There’s a nice range of challenges from ambushes, survival, demolition to straight-up slugfests. As you get to know your units you’ll be trying out different strategies and chosing different forces (especially armed with a few expansion units), so there’s lots of replay value even before you embark on the extra campaigns already available separately. 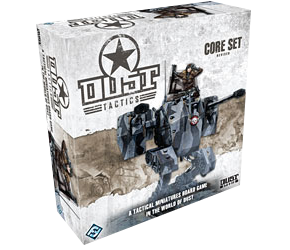 Dust Tactics is the perfect game for those gamers who love miniatures wargaming but don’t have the time to get into more complex and extensive systems, but it also promises a lot for the gaming hobbyist, with campaign expansions and lots of additional miniatures, including planes, available already. I forked out for the ‘premium’ painted edition (the original and the revised sets) because I have enough painting on the backburner, and the miniatures are very well done. This latest version of my summary and reference pack is for the revised core rules and all the current expansions. I’ve been enjoying your game summaries for several years now (we have very similar taste in games, fortunately for me!) and absolutely love the new site. I just threw $10 in the tip jar–a small compensation for all the great design work you do on all these cheat sheets. Any chance of a Dust Warfare summary showing up some day? As a board gamer, I love Dust Tactics, but I’ve actually been pleasantly surprised by how clean and smooth the DW mechanics are! Thankyou! I’ve been meaning to check out Dust Warfare for some time, so I’m sure I’ll get around to doing a summary for it eventually. While I don’t get the chance to play as much tabletop miniatures as I’d like, I’m certainly attracted by the idea of being able to re-purpose the DT minis on the full tabletop. You’re kind donation will no doubt go towards purchasing it! Whoops, just bought the Dust Warfare PDF rulebook! Any chance we’ll see the Operation Achilles rules added in the near future? I predict a very good chance. Looks like DT is changing the rule set and unit cards yet again, along with the dice as well. Is DT about to go the way of AT-43? No, Battlefront have picked up DT and I’m sure have made a big commitment to it, though I think the changes to the unit cards and the dice are unnecessary and poorly conceived. I’d be more worried about the tabletop version, Dust Tactics, which is languishing over at Fantasy Flight Games at the moment. After abandoning DT years ago after chasing all the pointless changes, I managed to get my hands on the both the premium FF core sets- and i’m in love with Dust all over again. There was no reason whatsoever to leave this elegant and simple system! Funny you should say that Tom, as I tend to agree with you. If they’d managed to stick to the original system DT would probably be a classic by now. I still love the original dice – they were quite iconic and memorable, and I still have absolutely no idea why it was necessary to change them to the confusing ones they have now. Any chance of a Dust 1947 review/video/article ? Hi Iwan. I’ve spent a lot of time on Dust over the years and yet another rules set was a bridge too far for me; the Battlefront rules were fine and this new ruleset was really just a result of the breakup between Battlefront and Dust Studio, rather than a desperate need for a rules shakeup. So I won’t be covering it in the near future. However I’m sure I’ll eventually get interested in the game again, and perhaps then I’ll check out the new version in depth.